This classy family home has a lovely homely feeling is ready to move into. It’s sitting at a great price at the moment and if you by any chance get itchy finger, then the basement could be your project. To one side of the basement there is the garage with an automatic doors and to the other side is an extremely large space with two massive sets of patio doors. The room at the minute is just being used as storage and a games/living room but is calling out to be used as a self contained apartment or as divinely spacious family room. Now on the ground floor, entering via the front door, we are lead into a small hallway which opens up into the living room. The living room has a set of patio doors leading out to the large balcony to the back. In the corner there is a built in fireplace. Off to the right is the kitchen, the kitchen has a door leading out to the front of the house. The kitchen is a good size and has lots of wall and floor units and there is also a pantry which is also the laundry room, so there is plenty of storage. Now going through the living room, we come to the bedrooms and the family bathroom. There are three bedrooms in total, all have built in wardrobes and the master is en-suite. Two of the bedrooms that are rear facing, have access to the large veranda that there is to the back. The property comes fully equipped with underfloor heating, 2 solar panels, pre installation for air-conditioning and an alarm system. 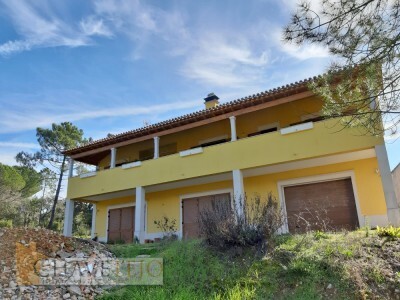 The property has 1920sqm of land which has various types of fruit trees and other shrubbery. Going the property is another plot of land which measures 3040sqm. Part of this plot is inserted in urban land classification so it could be possible to build on it with the the correct planning permissions. There is also a well here. The property is situated in the village of Longra which is around 8km from Tomar. To Castelo de Bode lake it is only around 30 minutes drive. This lake is popular for all kinds of water sport activities including swimming, sailing, canoeing, scuba diving, wind surfing and water skiing. The lake is also a haven for wildlife and there are many river beaches close to the property, ideal for relaxing on sunny days at the water’s edge.